Part of maintaining your treadmill and ensuring its long lifespan is buying a good quality treadmill lubricant. Have you already owned one? If not, then you're missing out massive benefits. Today, let me share with you 5 of the best treadmill lubricants we highly recommend – each is guaranteed to impress both your personal preference and your wallet. So, keep reading! Better treadmills are free of maintenance (but not all the time) while cheaper ones require occasional lubrication to keep it operating smoothly. Even though the tread belt seems like running well, it is still important to apply lubrication to prevent potential issues in the long run. What makes treadmill lubricant a must is due to many important benefits. First, it minimizes friction between the motor and the tread belt. Hence, track life is greatly extended. Also, lubrication helps prepare the machine for storage. Now, let's look at five of the best lubricants and find out which one is right for you and your machine. The Impresa Products Treadmill Lubricant is USA-made and easy to apply. Ideal for reducing treadmill friction, minimizing treadmill belt noise, and maintaining the machine. The bottle is easily squeezable. Hence, you have control over the amount of lubricant you're going to use. Plus, the nozzle is compatible with applicator hoses. Since the lubricant is totally made of silicone, long-term use when applied is highly assured. 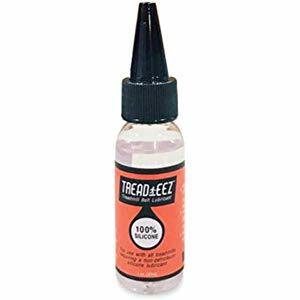 Moreover, Impresa Products Treadmill Lubricant is odorless, filled with a 4-ounce transparent, plastic bottle with a dropper-type cap, and comes with a money-back guarantee. The application process is made easier as well since the manufacturer put some instructions for use and a few tips at the bottle's back. The price of Essential Values Treadmill Belt Lubricant is quite disappointing for some, but the overall quality is something you should not overlook. It is made of 100% silicone so expect it to last longer once applied. Your tread belt is protected, keeps it stronger, and extends its lifetime. This lubricant has been tested too and doesn't include any toxic or harsh chemicals. Meaning to say it is safe for the environment. Highly efficient for reducing belt noise and friction between the motor and the treadmill. 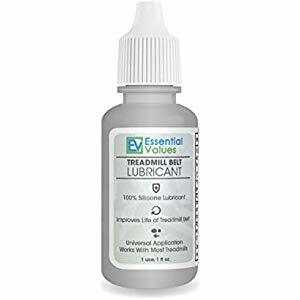 Essential Values Treadmill Belt Lubricant comes in 3 packs, with each bottle good for one application and measuring at an ounce. It is also available in an easy-squeeze bottle with a cap and an opening at the top. A money-back guarantee is offered. Known to be a non-stick dry film. When applied, this lube leaves a long-lasting and micro-thin coating that prevents dirt, resists corrosion, and decreases friction. DuPont Teflon Silicone Lubricant is said to be ideal for robust applications in the factory, farm, auto, and home. It is formulated to decrease stuck down chains quicker and make them efficient. As far as snow buildup reduction is concerned, this lubricant performs a great result. Using it is just a breeze. Simply spray on, wipe off, and re-lubricate as you need. The price point is not hefty to the pocket, which is another good point especially to those who are tight in budget. Apply on cutting surfaces like drill bits, blades, or on flat surfaces. Removes binding and squeaking in hinges, locks, windows, etc. Say goodbye to elliptical or treadmill squeaks with GSM Brands Treadmill Belt Lubricant! It comes with an easy to squeeze bottle, twist off cap, precision spout, and instructions printed directly on the bottle. Even those who love acrylic fluid art painting can also use the lube for their art. It seems to give your treadmill a new life. The belt will start to slide liberally every time you want after some applications of this product. It offers better control of how much you put into thanks to its easy to squeeze bottle. 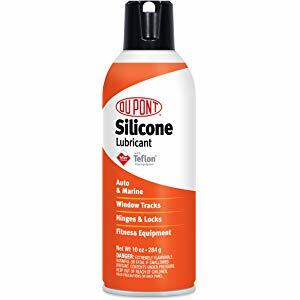 Similar to other lubes, this one also works with almost all models or makes for commercial or personal home folding or gym compact treadmills. When used properly, it helps to reduce belt friction and noise, cut down expensive repairs, and extend the machine's lifespan. Keep your treadmill always in tiptop condition with high-quality LifeSpan Treadmill Belt Lubricant. Another product we have on the list that is made of 100% silicone, it contains no petroleum distillates, propellants, or harmful solvents. Non-toxic, non-flammable, colorless, and odorless, this lube is great for any brand or model that makes use of non-petroleum based lubricant. It is a pump action spray bottle, with each bottle consists of four ounces of fluid. The manufacturer advises to lubricate after every 40 hours of use or once every 3 months. Even some spritzes of this lube can lay a thin, long-lasting coat around your machine. Although the price is a bit high compared to other products, it still proves to be a great value to your money. Treadmill manufacturers recommend lubricating the machine every 40 hours or three months of usage. With this, you should buy a lubricant that you can use at least for a year to save the cost. A lubricant that contains 100% silicone is recommended by most manufacturers. It's because silicone lasts longer and is not harmful to the machine, thus premature breakdown can be avoided. The applicator included in the bottle of the lubricant is another thing to consider. This will help in applying the right amount of lubricant and at the same time avoid a mess. By using an applicator there's no need to loosen the screws or bolts in the belt. In a treadmill, the tread belt and the deck are among the most critical parts of the machine. It is important to maintain the treadmill to lengthen its life so that you can enjoy more using it. Using lubricant is essential to maintain the good function of the treadmill. It's because lubrication reduces the friction and at the same time disperse heat. To ensure that the drive system will function efficiently, the amount of friction between the deck surfaces and the belt should be reduced. With this, you can expect that wear and tear is delayed thus extending the usable life of the treadmill. Another advantage of using treadmill lubricant is that it prevents the belt from becoming brittle. It's more cost-effective to use lubricant as compared to purchasing a new tread belt once it breaks. 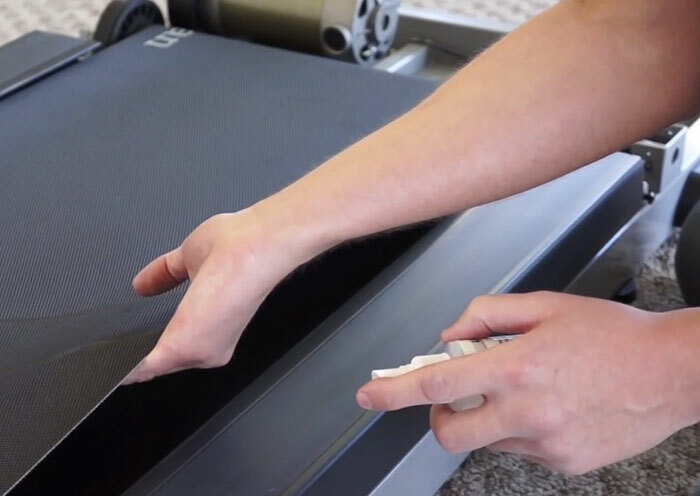 When your treadmill is in shape even after years of use, you will not have to worry about repairing damages, replacing broken parts, and spending hundreds of bucks! The frequency of applying lubricant into the treadmill depends on the amount or frequency of usage. It can be an advantage if your machine has an odometer or internal timers. It gives an alarm when you need to lubricate the machine after a specific number of miles or hours. The basic way when it's time to lubricate the machine is to check the deck surface. If you notice an oily coat or slightly waxy, then it needs to be lubricated. According to material composition, there are two types of belt lubricants that you may see in the market. These are wax lubricant and silicone lubricant, which both come in various forms. The wax lubricant comes in solid, powder, or granular form. The silicone lubricant, on the other hand, comes in liquid or spray can form. To choose between the two, refer to your treadmill’s manual about which type of lubrication is best used for it. If the data is not available, ask the customer service instead. It is important that you know which type to use to avoid damage and misuse. Remember, you are doing this to maintain and extend the life of your machine, and not break it down. The key to choosing the lubricant that you can use depends on your treadmill. The most popular lubricant used was paraffin, but it was replaced by silicone lubricant in these recent years. Before choosing and using a treadmill lubricant you should contact first the manufacturer of the machine. Otherwise, using inappropriate lube can cause damage to your machine. The deck surfaces and the belt will deteriorate soon if you will use unapproved lubricant for your machine. The cotton fibers of the so-called “cotton candy belt” that is underside may scrape off if not properly lubricated. Once the belt starts to disintegrate, the level of friction increases quickly. That's why it's essential to use the right lubrication appropriate to your machine. There is no single rule about the frequency and amount of lubrication you need to put into your treadmill. It varies from one treadmill to another. How often you maintain, clean, and preserve your machine actually depend on various factors, including the type, size, and quality of the belt and deck of your treadmill. Basically, if you are using your treadmill for leisure walks and jogs, you can apply lubrication once every year. If, on the other hand, you are a serious runner who trains regularly, lube the machine once every 6 months. Also, depending on the number of users of the machine, you may want to do the lubrication more or less often. Lubricating a treadmill is a simple job. In fact, some machines do not require using any tool. But you may need a simple screwdriver. The most important thing to note when applying lubricant is to ensure that it is applied consistently. When lubricating your treadmill, make sure it is not plugged into the power source. Read instructions on both the treadmill belt lubricant and your treadmill manual to know how to properly lubricate the belt of your machine. If you are not completely sure on how to go about the procedures, it is best to seek assistance from professionals. Make sure to tighten the screws and see to it that they are secure. Allow the treadmill to run at 1mph speed for about 5 minutes. This way, the lubricant will spread over the deck surface and its center. Warning! To Lubricate or Not? 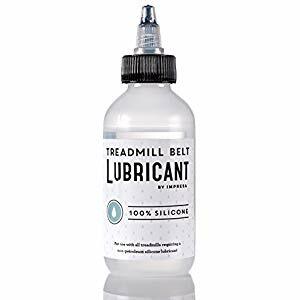 While you know that belt lubricants are generally used to reduce the wear of your treadmill’s belt and other components, you should also know that not all treadmills need lubrication. Some treadmills are designed with decks that are already pretreated and do not need to be lubricated. If you try to use lubrication on such deck, it might only damage the entire machine. Moreover, never assume that all models of a particular brand of treadmill have the same lubrication requirements. While some models allow their belts to be lubricated, other models of the same brand name do not. Hence, before deciding to use lubrication or not, make sure that your machine is compatible with it. Read your owner’s manual to know whether your machine needs it or not. So, there you have it, our top choices of treadmill lubricants available in the market today. It is hard to say whether one product is necessarily better than the other since all of them are made of 100% silicone. Each is formulated to work on various models and brands of a machine. With these lubricants, expect for painless and fast maintenance as possible!